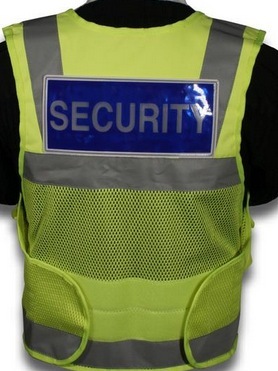 A security company that provides private patrols in Boystown is "reviewing its hiring process," Northalsted Business Alliance Executive Director Christopher Barrett Politan said, after one of its guards was found to have pleaded guilty to impersonating a police officer in November 2000. The guard and a co-worker were accused in 1999 of taking people's money while posing as police officers in Kane County, according to a news account on his defense attorney's website. He later pleaded guilty to impersonating a police officer and illegal use of a flashing blue light. Other charges, including armed robbery and armed violence, were dropped according to the attorney’s news account. We are withholding the man's name because there are no indications of wrongdoing during his tenure in Boystown. Court records show he has faced no criminal charges in Kane or Cook counties since his 1999 arrest. A suburban newspaper's contemporaneous report said that one of the alleged Kane County victims was an underage man from out-of-state who was caught drinking. The Beacon News, citing police reports, said that the victim had been handcuffed and was told that he would be released in exchange for $100. An adult who was accused by the cop impersonators of buying the 20-year-old's beer also paid a "fine" to the guards, the paper reported. The 1999 arrests took place after suburban police launched a sting operation near the pair’s workplace, reports said. Both men's state certifications—so-called "PERC" cards—have been in revoked status since 2002, when regulators determined that they had failed to inform the state of work-related criminal indictments. The man who has been working as Halsted Street security is reportedly in the process of seeking a reinstatement of his PERC card. He has declined to speak with us on the record. “While [the guard] awaits the reissue of his PERC card, he is not currently on the schedule for security services,” Northalsted's Politan said. Applicants who seek security work while their PERC applications are pending must provide potential employers with a statement that detail all criminal convictions. They are also required to submit results of a fingerprint-based background check. Politan declined to name the security contractor involved or to say how long the guard had been working on Halsted's private patrol. CWB Chicago has exchanged emails with the owner of Walsh Security, whose officers are frequently seen patrolling Halsted Street. He has not, however, offered answers to our inquiries. The Windy City Times reported in 2012 that Walsh Security had been operating as a contractor for the Center on Halsted without a state-mandated license. The firm is currently licensed, records show. The guard’s employment came to light after Chicago police referred to him as "Halsted Street security" in a recent police report. According to police, the man was battered by an unruly patron who refused to leave D.S. 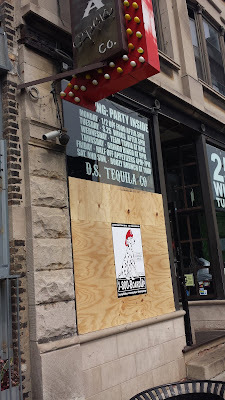 Tequila Company, 3352 N. Halsted, at 1:20AM on July 12. Police said the offender—who also faces a pending charge of resisting police in Cicero—struggled with the guard and suffered a cut to his hand as he and the guard fell into the bar’s front window. The offender is charged with battery and criminal trespass.